Last month I participated in a "Slice of Life" contest at Personal Scrapper. The top prize in the random drawing contest is a Making Memories SLICE machine. To participate, you had to complete 10 required challenges and had the option to complete another 40 optional challenges. I was able to complete all 50 during the six week contest. I'd like to share a few of my favorites. In February, Blake competed with the academic team at the district level. His Quick Recall team won FIRST PLACE and the school also placed FIRST overall! We were so proud of them! I had to use an "old" photo from the '90s, so I scrapped my 18th birthday. I can't remember what challenge this "roll out the Red Carpet" LO was for, but I LOVE this photo of the boys on our mini vacation to St. Louis last fall. The restaurant had a red carpet out front, to the boys practiced waving to their fans! One of the required challenges was to complete a mini album. I've wanted to document my favorite Christmas ornaments for quite a while. 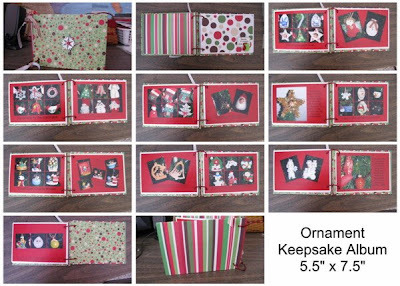 I made 5x7 photo collages of the ornaments divided up into themes and showcased them in a handmade mini album. For the b/w or sepia photo challenge, I used a photo from 1927 of my great grandparents "kissing in a cornfield." When going through my photos, I was surprised to see how much Kevin changed just from January to December of last year. I decided to use those two photos with the "review" challenge. My '08 calendar notes came in handy in compiling this page! On a recent trip to Archiver's I picked up 5 sheets of birthday themed paper by The Paper Studio. I was able to make twelve 12x12 pages out of that line. Here are a few of my favorites. I used my March kit from Personal Scrapper for the kit challenge. There were several "About Me" challenges for this contest. One was to scrap about someone in your family. I scrapped my parents at their prom. While going through older photos, I found this one of me and a friend at Kings Island. I decided to scrap my favorites from '94 for the "favorites" challenge. Here I am in the 4th grade with my then best friend, Becca. I still see her around town every now and then. The achievement challenge had me stumped a bit. Then I decided to document being named a state officer in FHA. I added my name badge to the page. The food challenge stumped a few people, but not me. I had pics of us eating out for Mom's birthday in December. We've become quite the crowd when we all go out to eat together! I lifted a LO by Layle Koncar for the "lift Layle" challenge. She was guest designer at PS in March. The monochromatic challenge was actually fun. I went green with Kevin's page of him helping Tom clean up after the ice storm in February. One of my favorite LOs from the crop used a Becky Fleck sketch. I was able to mix some old embellishments in on this page. I love crops and challenges. They always stretch my creativity. Good luck to everyone who participated in the Slice challenges. I'm looking forward to the winners announcements. Amy!!! I love all of these layouts. Several of them I haven't seen yet. What a treat to come visit your blog and be inspired today. Thanks for sharing your favorites. Amy, they are all great, but I am still cracking up again over that red carpet walk! I just love that picture and your title! Thanks for sharing, and good luck on the Slice contest! Awesome as always!! I love the yard work and red carpet ones the best but they are all great!! wow! You are amazing! Great job and beautiful work!